While bouncing at a Pub the other night, I was in close proximity to the hostess stand and heard one of the hostesses who was in her early 20’s talking to two younger hostesses who were both 18. 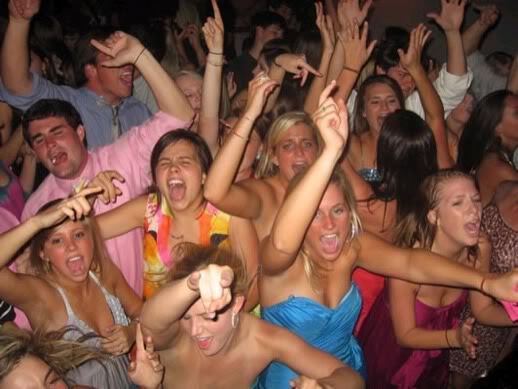 They had been invited to a frat party at a local college where my oldest daughter happens to be a sophomore. The older girl was trying to talk them out of attending, but they were not hearing it. She then asked my opinion. The first thing I asked was if they were planning on telling their parents where they were going and they both said no. My response was that should be an indication that maybe they were not making the best decision. Realizing they were going to go anyway, here is the advice I gave them and I thought it was worth repeating here. The first thing I told them was that as a retired cop I could not count the number of times I stumbled upon a young lady in a compromising situation with a young man in a vehicle or hotel room. If the girl was underage, I would always call the parents and ask them if they knew where their daughter was. Seldom was it where they actually were. The closest you would get was that they might be with the girlfriend that they were supposed to be with. Another troubling issue was that many times they were under 18 and not carrying any identification. So, not only were they not where they were supposed to be, if something happened and they were found alone, there would be no way to identify them. Since there was no time for training, I instead opted to give them information. What is not covered here is my advice about alcohol and drugs, which was that if someone has to tell you not to get drunk and stoned around a group of people that you don't know, there is probably no advice that can save you from yourself. 1) If you are not going to tell your parents where you are going, make sure that at least one person who is not with you knows where you are and what time you should be back. Make a habit of at least texting that person when you are secure (home) for the night. 2) NEVER go out alone. 3) NEVER accept a drink from anyone unless it is sealed, meaning you break the seal when you open it. NEVER leave a drink unattended. 4) Try to at least know the street you are on at all times. Knowing a landmark that is close will always help in expediting an emergency response. 5) Realize that many attacks will begin with someone trying to control your movement or confine you to an area such as a vehicle or a room. This will also include cutting you off from other people. Recognize this for what it is and do anything you need to in order to get back to other people. 6) If under any circumstance you feel yourself losing consciousness, call 911 and try to tell them where you are (see #4). 7) Faking being sick is an excellent way of leaving an unsafe situation while at the same time saving face. 8) If you are under physical attack, your best bet as a female against a male is scratching and biting, especially the face and hands. Thumbs in the eye sockets are effective but many will be unable to commit to such an act. 9) If the point comes when the attacker has his pants down, grab, twist and rip the testicles sinking your nails in as far as possible. This will cause excruciating pain and blood loss, as well as slowing them down from chasing you. 10) Things you should always have with you include your ID, phone, pen, whistle, and flashlight. Both the pen and flashlight can be used as improvised weapons. The next day I had a conversation about this with my daughter and here is what she had to say on the subject: “When I go out, my phone is in my back pocket, my ID in my other back pocket, my folding knife is in my front pocket and my money and my keys are in my boot under my jeans”. She said she does not carry a purse because it can be a target for theft and that by separating her things she makes it harder for someone to get all her stuff. She has redundancy on her key chain with an Alpha Industries Kubaton, whistle, and a Gerber Artifact. Once your daughter ends up on the news, it is too late. Talk to them now and seek effective education and training that will allow them to survive. This type of training is far and few between, so be critical before spending your money.